Have we been going even slower than usual on the Steel Bridge? Current speed for trains over the Steel Bridge span is 5mph instead of the usual 10mph. 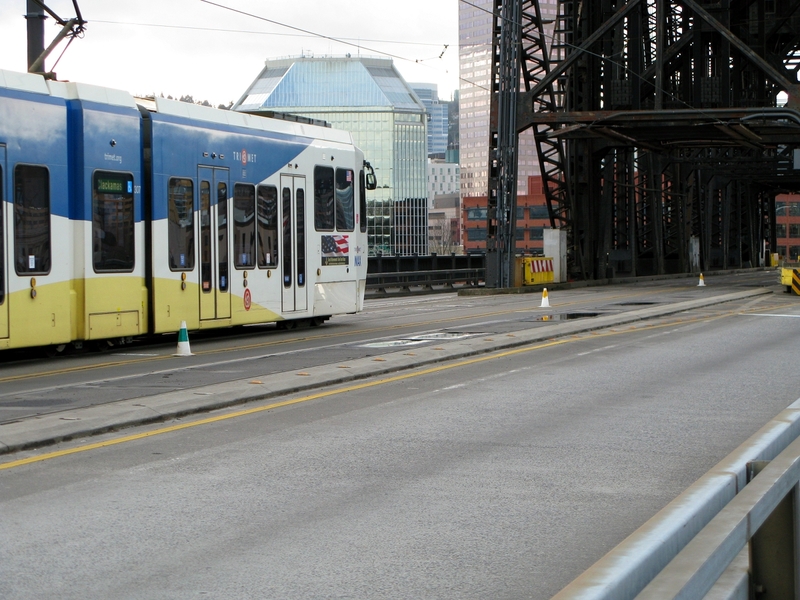 I’d mentioned this way back when in the “How fast do the trains go?” post – the speed over the Steel Bridge span is typically 10mph in order to (relatively) reduce vibration while crossing the span, which can damage the microswitches & sensors and other mechanisms on the bridge. I say “relatively” because if you’ve ever walked over the upper deck of the bridge at the same time a train is crossing it, you can feel the effect it has going over the span even at 10mph. But a few Sundays ago, the speed was reduced to 5mph on the span because some of the sensors on the bridge had gotten damaged, and a slower speed means less vibration. At that time, a train order was issued directing trains to proceed at this reduced speed. Since a train order can only last for 24 hours and this was going to last longer than that, a special instruction (which can last for up to a year) was then issued until everything gets repaired. Within a few days, the cones were placed on the bridge to mark the area affected by the slow order. 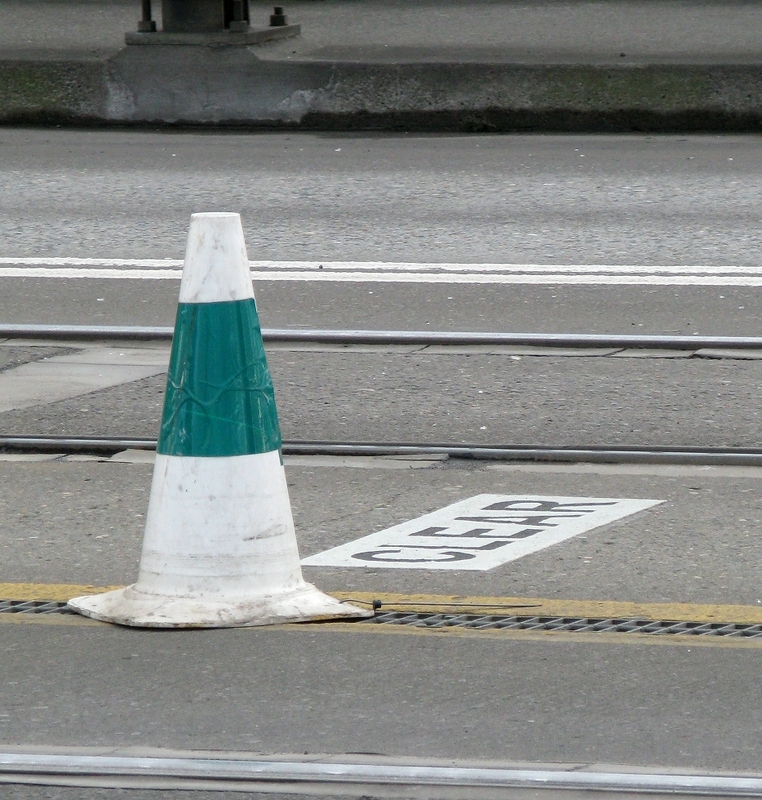 Ignore the green cone in the above picture for a moment – the yellow cones, which are placed in pairs 100′ apart, indicate that speed is reduced over the span. As soon as the front of the train reaches the first yellow cone, it must reduce speed to the necessary level (5mph in this case) and maintain that speed until the front of the train reaches a green cone on the other side. So in the above picture, the green cone is for eastbound trains and the two yellows are for westbound trains. A similar arrangement is on the western side of the span, though only one of the yellow cones is visible from this angle because of the grade of the bridge and the concrete divider. The green cones are placed 200′ from the span. That’s the length of a train, meaning a train can resume normal speed there since it’s clear of the span once the front of it reaches that spot. You may have seen the word “CLEAR” on the bridge about 200′ from either side of the span which predates the cones being used for this current special instruction. That lets you know under normal operating conditions that the usual CBD speed of 15mph can be resumed once the front of the train gets to that point. 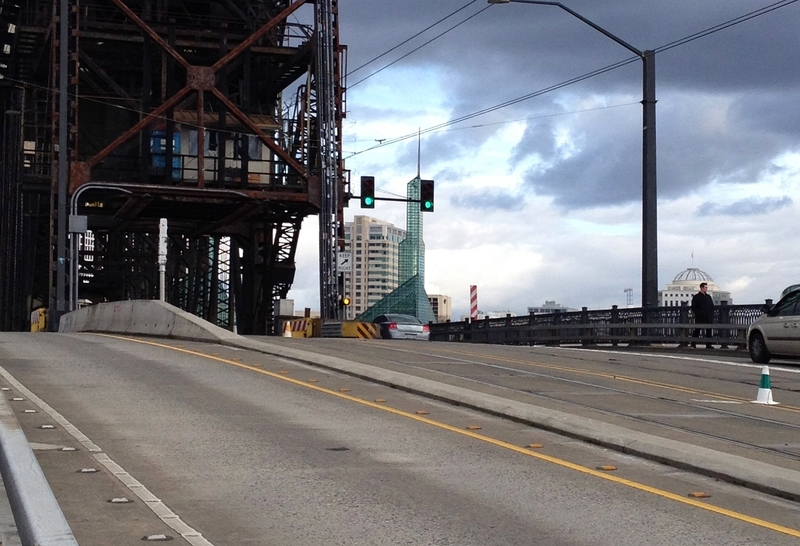 I have an old post showing a view from the cab crossing the Steel Bridge eastbound if that helps with the visuals. 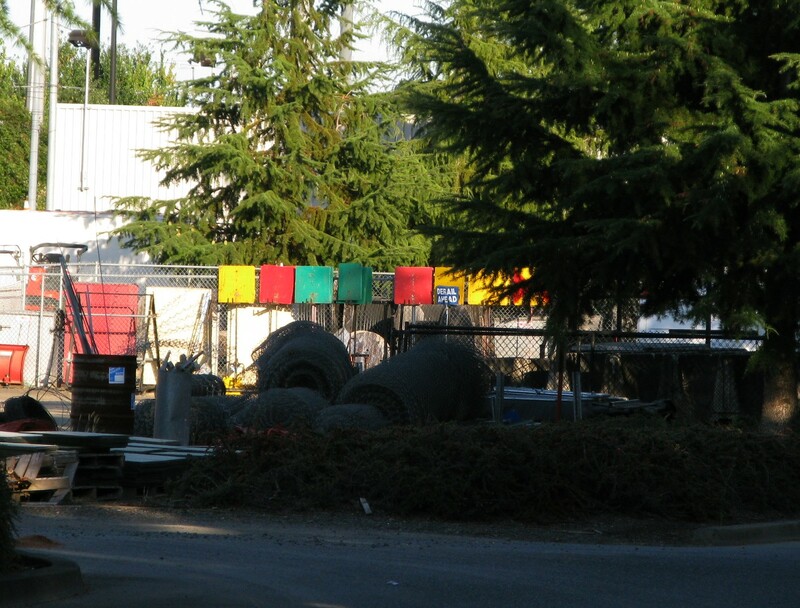 The cones are nearly functionally identical to wayside flags, which have been mentioned in this blog before. Flags with pointed ends are used in ballasted track, flags on tripods are used on paved t-rail, and cones are used in low-speed paved areas. The tunnel uses flags that are attached to the handrail on the walkway, but I don’t have any pictures of those. There are some differences between how cones and flags will be arranged for use. In areas of the alignment that use flags instead of cones, only one yellow flag is used for a slow order unlike the pair of yellow cones used in low speed paved areas. 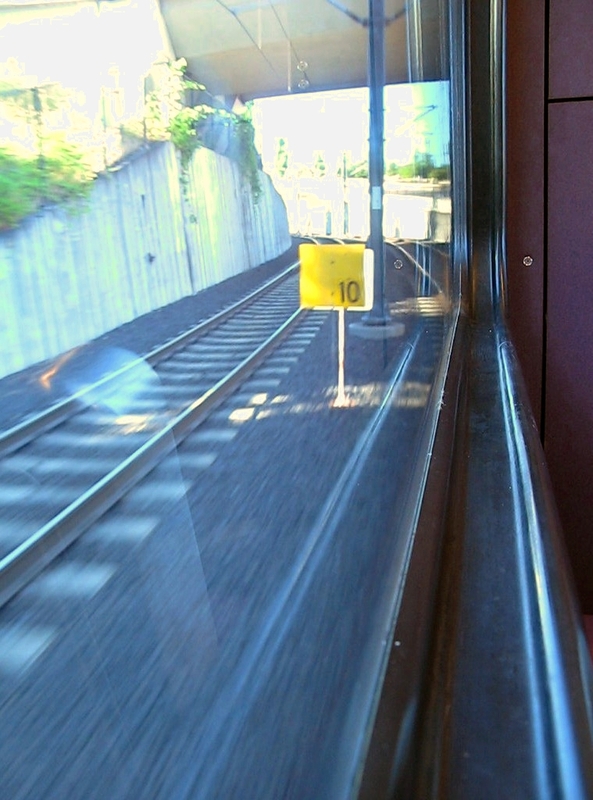 Where flags are used for a slow order, trains must be at the ordered reduced speed when the front of the train reaches the yellow flag. 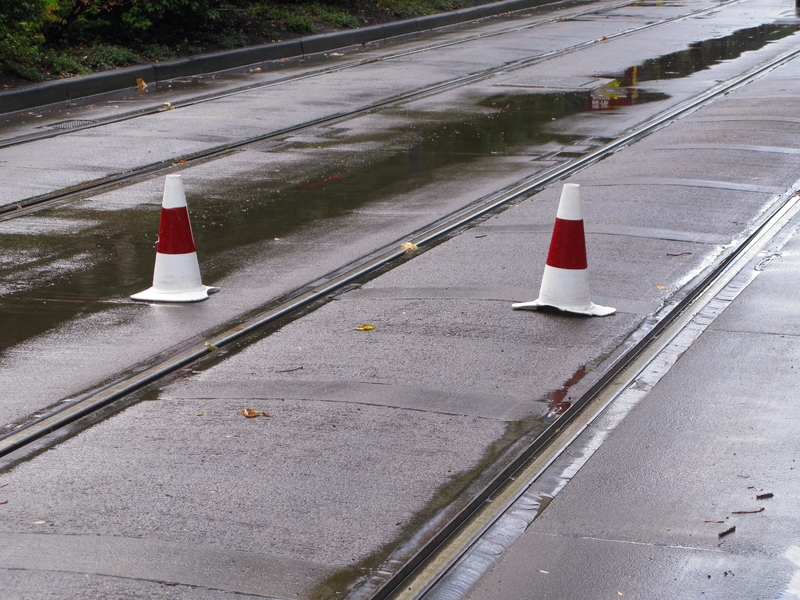 Similar to the cone arrangement, trains will maintain that speed until the front of the train reaches a green flag. 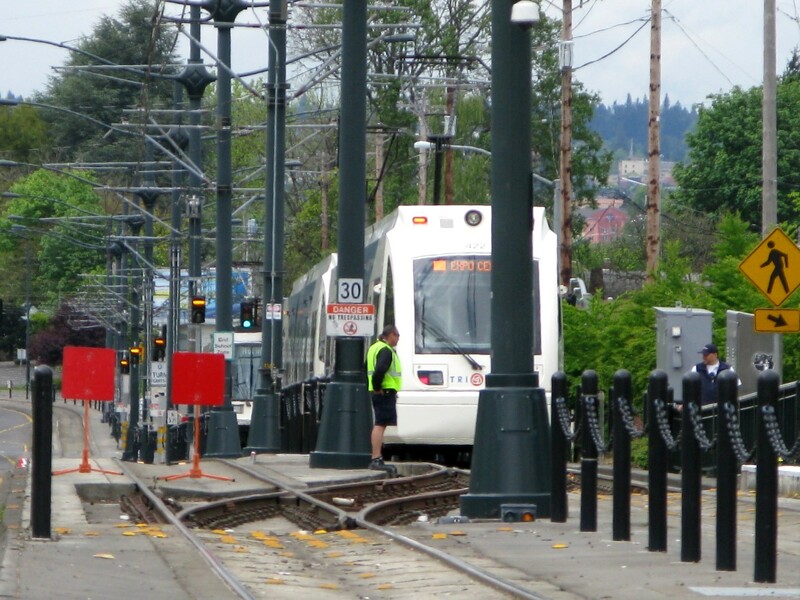 This entry was posted in speed and tagged light rail, max train, portland, public transit, public transportation, rail, railroad, steel bridge, trains, trimet. Bookmark the permalink. Just remember that you’re going over a 100+ year old bridge with a really heavy vehicle. Add to that the fact that there is a gap in the rail on each end which means you’re bouncing your train on every axle and how many trips over the bridge are there everyday…. Having personally been under the deck of the bridge while trains cross over it I can tell you first that it’s not still under there and secondly that the effect is intensified exponentially by increased speed. Elephant in the room – Was this bridge even designed for this use? NO Should Trimet be looking at ways of replacing or remodeling this bridge? YES But alas they’re to busy building a bridge to carry one line of service over the river…. Rob- When you ask if the bridge was designed for a train, I would say yes. When Union Pacific Railroad and the Oregon Railway and Navigation Company built the bridge it was intended for trains. Really heavy freight trains. MAX traffic over the top of the bridge doesn’t seem to be the problem the switches and sensors seem to be the problem. The bridge is old but seems to still be doing its job. The point I was making is the bridge was not designed 100+ years ago for modern LRV traffic across the upper deck and the frequency is hard on the old guy.. That bridge is riveted not bolted together, that means it flexes by design and the faster the trains go the more it flexes. Do MAX operators have to call the Steel Bridge Operator before using the bridge ever? We have to call them every time we use the lower level whether we have the signal or not. No, there’s no way to contact the bridge tender from the train cab. If the signal is permissive, then the train can proceed. If there’s going to be a lift, Control will be notified and in turn notify operators. Update – There were significant low spots in the ball of the rail (corrugation) on the Eastbound that were repaired by the contract welder last week. This should result in a smoother ride for operators and the public. The 5 MPH slow order will not be removed until ODOT approves it. Thanks for the update! I think I had seen photos of those sections of the rail.